I’ll admit straight up, Spain is unfortunately one of the least dog-friendly countries in Europe. Although many Spanish own and pamper their dogs, they don’t have the same attitude towards dogs that many other European countries do, where dogs are frequently allowed inside restaurants and allowed on public transport as a right. 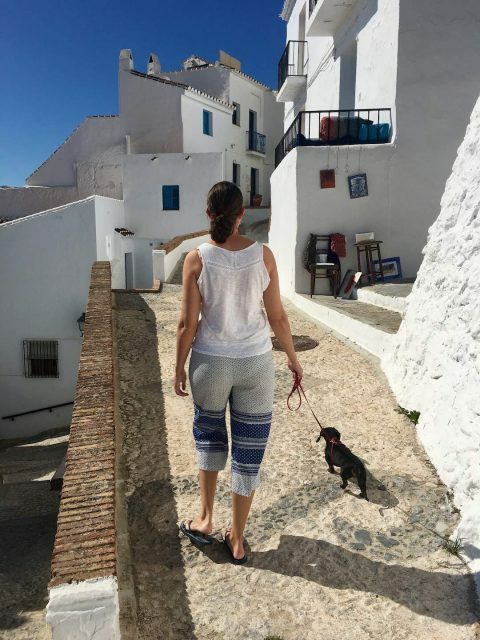 Travelling in Spain with your dog is more similar to travelling in the USA or Australia (where there’s also a lot of dog owners, but not many places that allow dogs), although it feels like it’s improving and there are some parts of Spain that are more dog-friendly than others. 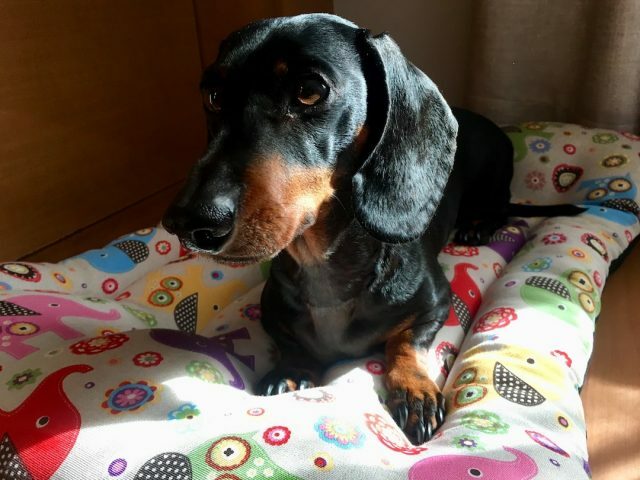 But this didn’t hold me back from travelling around Spain with my dog, and I’m sure it won’t discourage many other dog owners from taking their dogs with them to Spain, whether for a short trip or a longer stay. 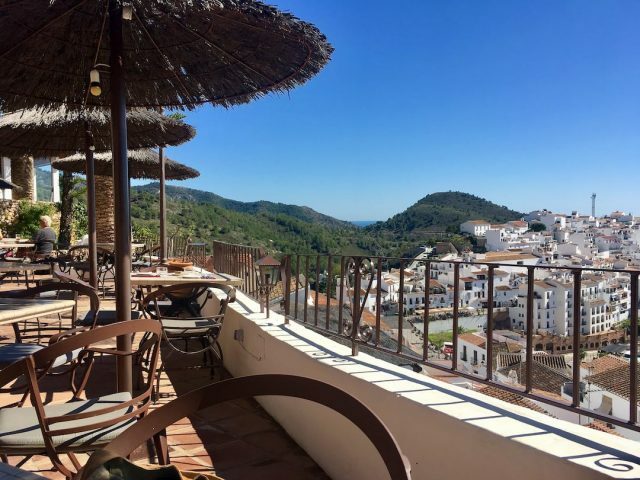 After all, Spain is a terrific destination, especially to escape the cold during the cooler months in Europe. It just requires understanding where dogs are and aren’t allowed in Spain. Here’s my tips on travelling in Spain with a dog. Not sure about the best way to travel from the UK to Spain with your dog? 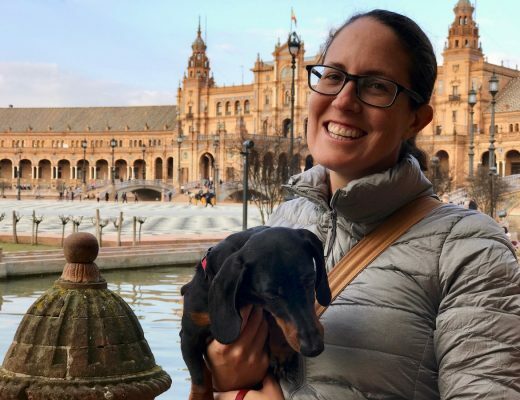 Check out my guide to every option for travelling from the UK to Spain with a dog, no matter if you want to take your car or travel on foot. Plus, don’t forget to protect your dog from Leishmania over the summer. In the majority of restaurants in Spain, unfortunately you won’t be able to dine inside with your dog. On our most recent trip, we asked at many places in southern Spain and the Canary Islands, and nearly every place the answer was no. About the only exception was a small hotel we stayed at in Guadalupe, which considering it allowed dogs to enter the hotel rooms (via the restaurant downstairs), also allowed dogs in the restaurant. Another dog-friendly hotel we stayed at also allowed dogs in the lounge section of its restaurant. I’ve also heard reports from someone who had spent a long time in Barcelona, that many restaurants around Barcelona allow dogs inside. Certainly Schnitzel was allowed inside the famous La Boqueria market when we visited, even charming a butcher into some free scraps! 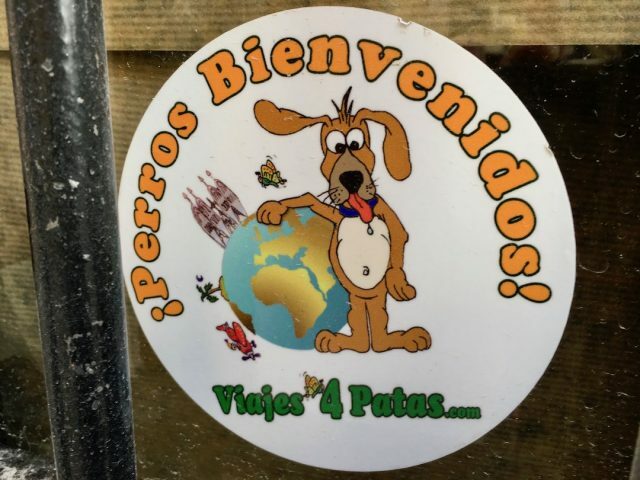 For other parts of Spain, keep a look out for a “Perros Bienvenidos” sticker for restaurants that welcome dogs (picture above). Although you’re sadly more likely to spot no dogs allowed signs. If there isn’t any sticker, it still might be worthwhile asking at the door whether your dog is allowed. Luckily though, the weather in Spain is better suited for outdoor dining than many other parts of Europe. Even if it’s winter time, it still might be fine if you’re rugged up, or else there might be heaters on the footpath next to the outdoor tables. But during most of the year, outdoor dining is the norm, and I didn’t come across any restaurants that weren’t fine with our dog sitting by our side. While small dogs are generally allowed on public transport in Spain, as long as they are in a carrier, you’ll have a much harder time travelling on public transport with a large dog. For starters, on long-distance trains in Spain, only small pets are allowed. This is defined as small dogs, cats, ferrets and birds, up to a maximum weight of 10kg. Only one pet is allowed per passenger, and the dog needs to be in a carrier or cage, with a maximum size of 60 x 35 x 35 cm. For some ticket classes, pets travel free, otherwise there is usually a charge of 25% of the economy ticket price. For more details, check the RENFE pet policy. When we firstly arrived in Spain after flying from Australia, we travelled from Madrid to Seville via train, with our dog still in his large crate used for the flight. In reality, the size of the pet and the size of the carrier is unlikely to be checked. It wasn’t in our case, and our crate was certainly larger. I’ve heard reports from some travellers that they’ve travelled with large dogs on trains many times in Spain, without any issues. However, there is a chance that you will get pulled up. I’ve also come across a petition to change the rules for large dogs, so the rules are probably enforced part of the time. 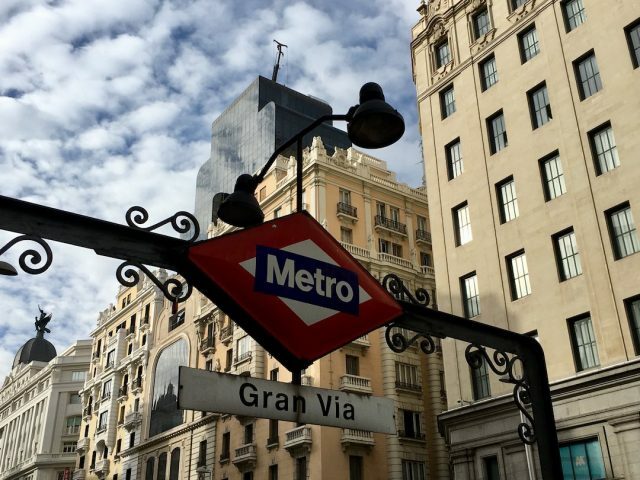 If you’re spending time in Madrid with your dog, luckily the rules for dogs on the metro changed in 2016. Previously only small dogs in carriers were allowed, but all dogs are now allowed on the metro, albeit with the following rules: only one dog per passenger, must be on a lead no longer than 50cm, must be muzzled, must travel in the last train carriage, and not allowed to travel during peak hour (between 7:30-9:30am, 2-4pm and 6-8pm, from Monday to Friday, except during July and August). Small dogs in carriers do not need to follow these rules. In either case, dogs travel for free. What about other cities in Spain? In Barcelona, the rules for dogs on the metro also changed a few years ago, and are similar to the rules in Madrid. Only the peak hour exclusion times are different: 7-9:30am and 5-7pm. However, some cities still only allow small dogs in a carrier on the metro, such as in Valencia. Check the rules of the local transport authority in the city you are visiting, plus for the type of transport you are taking. One other tip about public transport: it’s probably best to avoid long-distance buses in Spain. The general rule is that dogs are not allowed onboard the buses, and must travel in the luggage compartment underneath the bus. Like most dog owners, I’m not happy to have my dog travel in this fashion. Due to the rules discussed above, if you’re travelling in Spain with a large dog or you’re travelling with a small dog away from train routes, it’s best to consider hiring a car. Luckily, hire cars are often quite cheap in Spain, although be wary of some small hire car operators. Check out my tips for hiring a car. Luckily, Spain is more accommodating when it comes to finding somewhere for your dog to stay, compared to finding dog-friendly restaurants or transport. During our multiple visits to Spain, we’ve stayed in a mix of Airbnbs and hotels, and have never had an issue finding dog-friendly options. We even stayed on a boat at a marina in Tenerife for nearly a week! Spain still doesn’t allow dogs in quite as many hotels are many other European countries, according to my research. In hotel listings for Madrid, Barcelona and Seville, dogs are allowed by 17-18% hotels (almost the same percentage for each city), putting the Spanish cities towards the bottom of my ranking of European cities. My main recommendation is to not leave your accommodation search to the last minute. Here is a list of my recommendations for pet-friendly hotels in Madrid, Barcelona, Seville, Valencia, Alicante, San Sebastián and Tenerife to get you started. If you’re looking for additional dog-friendly accommodation options in Spain, follow my instructions for finding dog-friendly options on Airbnb, Hotels.com and Booking.com. With hotels, my preference is to book with Hotels.com, as the dog fee is usually displayed, but Booking.com will list more options in rural areas of Spain. For cheaper 2-3 star hotels, dogs are usually charged around €5 per night or are sometimes free. Two chains in particular that are usually dog-friendly in Spain are Petit Palace (with 4-5 star hotels where dogs stay free) and Campanile (2-3 star hotels that charge €5 per night). One extra warning: book your accommodation well in advance in Barcelona, unless you’re prepared to spend up big. There’s not many cheaper options available in Barcelona, including Airbnbs, which are virtually banned, due to all Airbnbs requiring a license and no new licenses being granted. Add to the mix requiring something that is dog-friendly, and you’ll find not many accommodation options available to book and prices that are higher than elsewhere in Spain. While travelling around Spain, you’ll find plenty of dog-friendly sightseeing options for you and your pup. There’s countless historic city centres to wander around, from Seville to Toledo to Segovia. 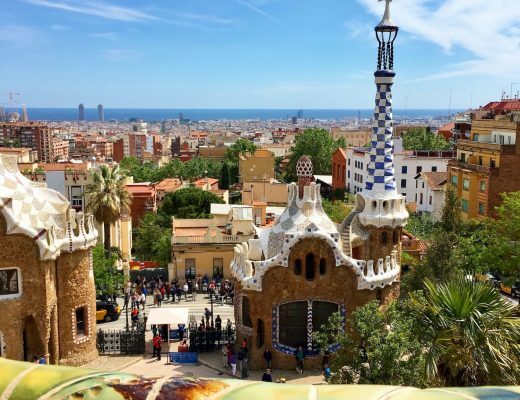 In Barcelona and Valencia, explore the vibrant street art scenes, along with your dog. And don’t miss out on the beautiful national parks, including in the Pyrenees and Teide National Park on Tenerife. 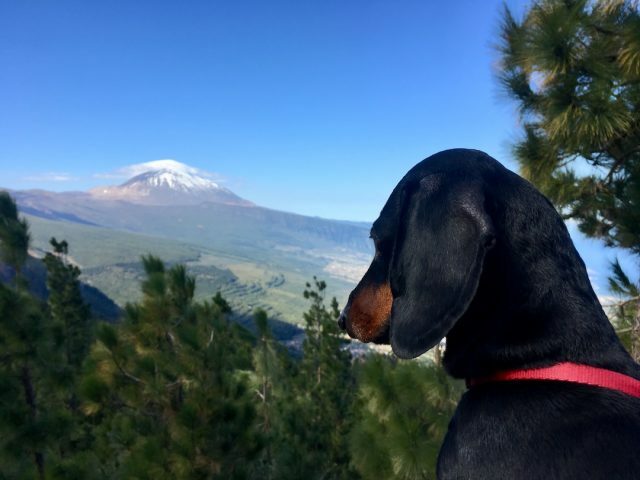 The majority of national parks in Spain allow dogs, although generally on a leash, although Doñana National Park near Seville, best known as a refuge to migratory birds, naturally prohibits dogs. Interested in visiting some of the many UNESCO World Heritage sites scattered around Spain? 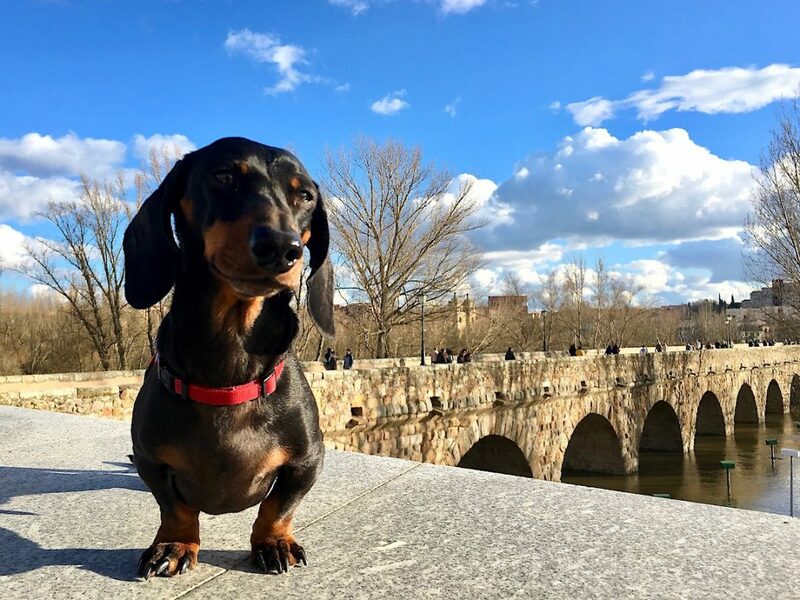 Check out my recommendations for the most dog-friendly UNESCO sites in Spain. 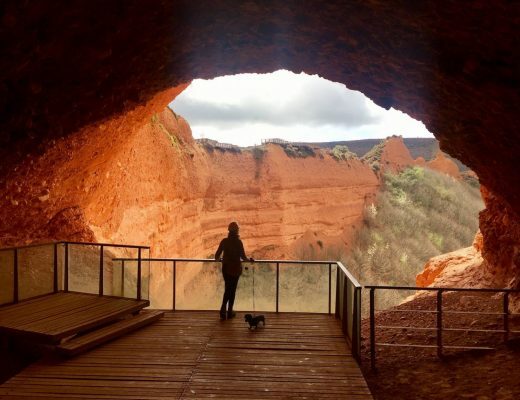 And don’t also miss out on visiting the dog-friendly Basque region. I couldn’t talk about visiting Spain and dogs, and not mention beaches. Or more specifically, are dogs allowed on beaches in Spain? First up, you’re likely to have more success at finding dog-friendly beaches in Spain if you visit outside of summer. For example, dogs are allowed on beaches in Barcelona outside of the summer season, which is officially from the 1st June to the last Sunday in September, plus weekends either side. Visiting Barcelona with your dog in May? Visit any beach you want. Heading there in July? Your options are more limited. This is probably the case for most of the country. For example, I visited San Sebastien during April and found plenty of dogs playing on the main beach, with no signs prohibiting dogs. But over the summer, dogs are likely to be prohibited. 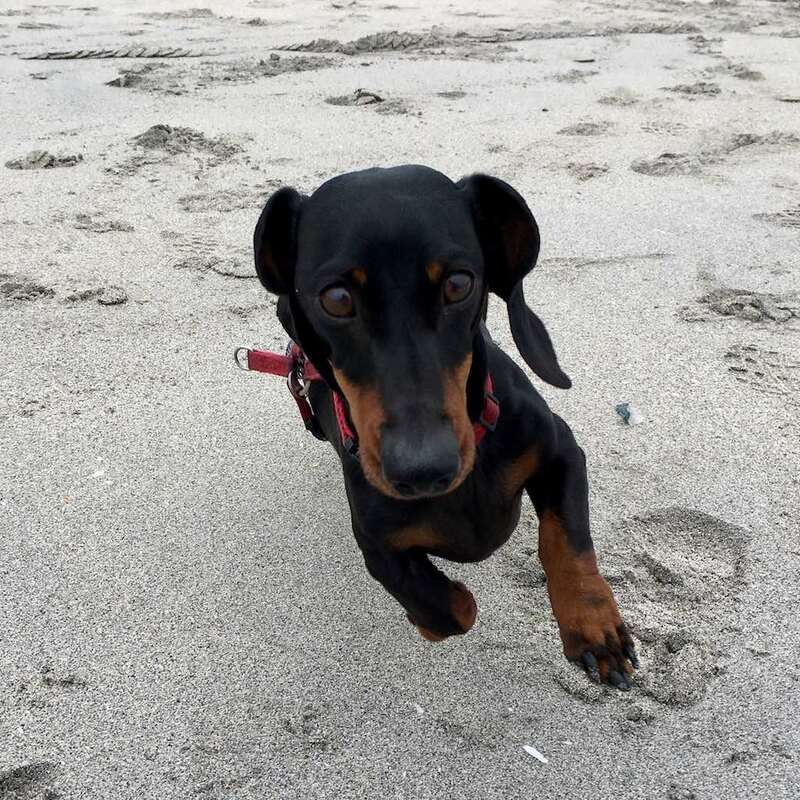 If you are visiting Spain over the summer and want to visit the beach with your dog, there are some options, but they are limited and be prepared to travel a fair distance. It’s best to research this before booking accommodation. Head to the main website to view further details on each of these beaches.